Cracker Barrel has weekday lunch and dinner specials starting at about $6. The lunch specials include lunch-sized portions of favorites such as Baked Chicken n’ Dressing and Chicken Pot Pie. 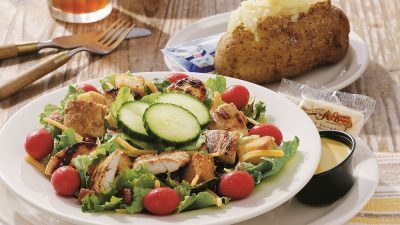 You can find the lunch specials menu at Cracker Barrel Weekday Lunch Specials The lunch specials are generally priced at $5.99 and are served Monday – Friday starting at 11 AM. Baked Potato or Sweet Potato. Cracker Barrel’s dinner specials are usually priced starting at $7.99 and feature generous sized portions of favorite meals with your choice of two country vegetables plus made from scratch Buttermilk Biscuits or Corn Muffins and real butter. You can find the dinner specials menu at Cracker Barrel Daily Dinner Specials. Cracker Barrel frequently has merchandise on sale for up to 70% off plus free shipping on orders over $50. Visit: Cracker Barrel Merchandise Sale to see the sale items and start your order. Cracker Barrel Old Country Store, Inc. is an American chain of combined restaurant and gift stores with a Southern country theme. The company was founded by Dan Evins in 1969; its first store was in Lebanon, Tennessee, which remains the company headquarters. The chain’s stores were at first positioned near Interstate highway exits in the Southeastern and Midwestern US, but it has expanded across the country during the 1990s and 2000s. As of 2018 the chain operates 653 stores in 45 states. Cracker Barrel’s menu is based on traditional Southern cuisine, with appearance and decor designed to resemble an old-fashioned general store. Each restaurant features a front porch lined with wooden rocking chairs, a stone fireplace, and decorative artifacts from the local area. Cracker Barrel is known for its partnerships with country music performers. It has received attention for its charitable activities, such as its assistance of victims of Hurricane Katrina and injured war veterans.